I was out picking blackberries yesterday and noticed how difficult it is to get to the big juicy berries without getting pricked by the thorns that the blackberry plants seems to proudly use as their protection. There are so many of them. There were times they had a hold of my shirt, pants and arm and I had to just pull hard to get out. It felt like I had 10 cats all over me using their claws to hang on to dear life! 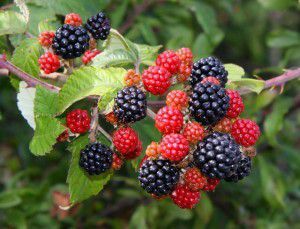 There are blackberries everywhere on the mountain where I spend my summers. So here are these plants filled with healthy berries rich in antioxidants and I am so excited but dislike the process. I began to look at the difficulty involved with picking them as a metaphor to life. As I was trying to get to the biggest and juiciest berry, I had to really maneuver with skills to avoid the thorns. It involved patience which is not my forte, especially when it comes to having something readily accessible and given as a gift from mother nature. All I thought about was how I wanted to fill up the container I brought so I can show off my pickings upon my return. I grew up in a part of Canada where blueberries grew wild all over……THOSE are my favorites! In addition, there’s NO THORNS involved! So, put me in a patch of wild blueberries and I feel like a kid in a candy store! Blackberries don’t have the same feeling because of the work involved and fear of getting pricked or captured by the thorns. However, they are still appealing enough for me to go through the pain of getting to them. In life, there are people or situations that can feel the same. They feel like the thorns that are not pleasant to deal with in order to get to the outcome we want. How do we go about getting around the thorns without being uncomfortable or getting hurt? We can approach it in many ways. We can pick the berries that are on the outside of the bush and stay safe. Our other choice is to step out of our comfort zone by going in deeper into the plants where we might feel the prick of the thorns or have the thorns leave marks on our skin. The route with a bit of pain often gives us a much greater reward. How to you go after what you want? The safe way or the challenging way? My experience of picking blackberries showed me that going deep into the plants, even though I was a bit fearful and uncomfortable, led me to the outcome I wanted which was to bring back the berries that were the sweetest. As I mentioned earlier, it required patience and maneuvering skills. I had to take my time, observe the way the branches were falling and slowly maneuver my hand so that it would not be stopped on its path by the thorns protecting the berries. I also thought as to why do these plants have thorns? Why do they need protection? I know that bears don’t let the thorns get in the way. I was a little resistant to mother nature as to the need for the thorns since the berries would fall to the ground anyways once over ripe and if not picked and eaten, would just dry up in the sun or return to the earth’s soil. So, why have thorns? Well, it’s not for me to question mother nature and just like in life, many of the thorns we encounter, we resist. It is the resistance of them that keeps us from getting to what we want. I decided to accept the beauty of the thorns and let them be a life lesson. If there is something you want in your life, it probably means there are many challenges in getting it or else you would already have it. Do you let the thorns get in the way? Do you let lack of patience or skill get in the way? Or do you let fear get in the way? Good things sometimes come easy but great things require us to step out of our comfort zone, practice patience and acquire whatever skill we need to get there. By skill, I don’t necessarily mean going back to school, although it could mean that for you, but a life skill such as patience, stillness, moving slower and not being impulsive, or allowing yourself to feel a bit of the pain that comes with the challenge. Trust me, the thorns did get me but it didn’t stop me from getting the berries. What do you allow to stop you in your life from getting to the berries? How much power do you give the thorns?